Today we’re off to Pamplona and the main event. The bus ride takes a couple of hours. 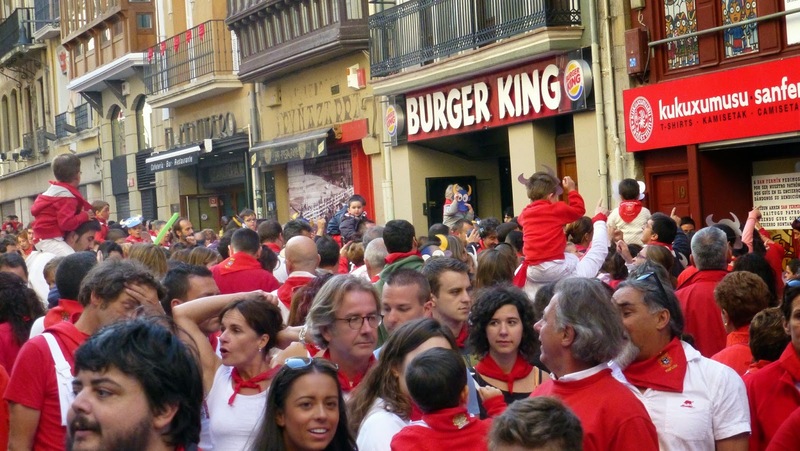 In Pamplona we are greeted by a sea of people all dressed in red and white – the color of the festival. 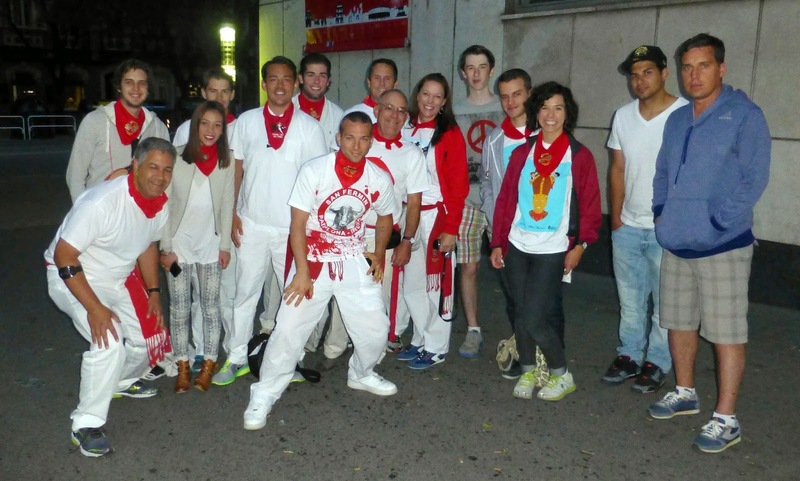 The Running of the Bulls is a lot like Stampede Week in Calgary – everybody dresses up – and everybody participates. Our hotel is in the newer part of Pamplona and is quite nice and modern. After we check in Carlos suggests we head down to the old part of town, pick up our running outfits, and check out where the run will take place the next morning. As we draw closer to the old section of town the crowds grow bigger and bigger. By the time we’re at the outskirts it’s a veritable sea of people. There are numerous venders selling shirts, pants, scarfs, and sashes. Moments we’re twenty bucks lighter, dressed in our Pamplona duds and indistinguishable from the other thousand people milling around. Carlos takes us further into the old city and we walk – or attempt to walk – the route the bulls will take the next morning. The streets are packed with people –a veritable river of red and white – moving in one direction. It is impossible to go against the flow. The street is only about twenty feet wide – there are no sidewalks only the sides of buildings. There are young people, old people - people with children on their shoulders, marching bands – everyone jumbled together into one big happy throng. The second floor balconies are packed with happy revelers. Some of the balconies have small bands on them – competing with the band on the balcony across the street the revelers on the street. If you are the least bit claustrophobic this is not a place to be – and tomorrow morning they’re going to release a half dozen or so angry bulls into this throng. Large LCD monitors on street posts and in bars are replaying the mayhem from the run earlier in the day. There are close up shots of people being tossed in the air by bulls, trampled by bulls, and left lying in the street. I’m beginning to have misgivings about this. I decide maybe I’ll watch the next day’s running rather than participating. There’s always a chance to run the following day. ...and there going to let the bulls go in this??? Lost in my concerns I get separated from the group. I look around for a familiar person – but everyone is dressed alike. In a panic I try to head back up the street to find my group but despite my efforts am swept back. Someone hands me a beer. I decide it isn't too bad to be part of the crowd. Then I realize it’s Carlos who handed me the beer. He pulls me into a backwater and heads back into the river to coral the rest of his herd. He eventually finds most of them and we head off to a tapas bar to have dinner and watch Germany trounce Brazil in the World Cup quarter finals. When we leave about midnight to head back to the hotel the streets are still packed. He warns us to get some sleep as we’re expected to be back down there by 6:40am. RUNNING WITH THE BULLS - NOT! Evidently not everyone in our group heeded Carlos’s warning about getting some sleep. Some of the younger members of our group look like zombies as they stumble into the hotel lobby at 4:45am. Carlos tells us not to worry about breakfast – we’ll be served some in the suite where we’ll be watching from the balcony. It has rained during the night and the streets are slick which means the run will be even more dangerous than usual. About half of our group has decided to run today. The rest will watch from the safety of the balcony. One of our runners, Brad, decides to film the event with a surreptitious Go-Cam hidden under his shirt. Having a camera, hidden or not, is strictly forbidden if you’re running. I point out to Brad that in the 600 years they’ve been holding the event the officials have probably seen everything. Brad’s confident he won’t get caught. There is still a few minutes to go so I head for the living room to sample the “breakfast” Carlos promised. It consists of a few stale cookies on a paper plate and a small carafe of tepid coffee. 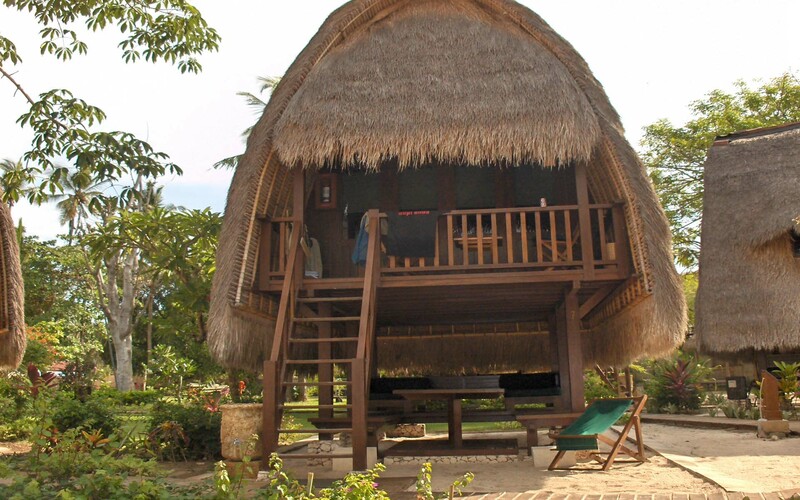 I pass on breakfast and head back to my spot on the balcony. Our group of runners joins the 3000 others penned up just beneath our balcony. I notice several ambulances parked just outside the barricade- their back doors open – ready. 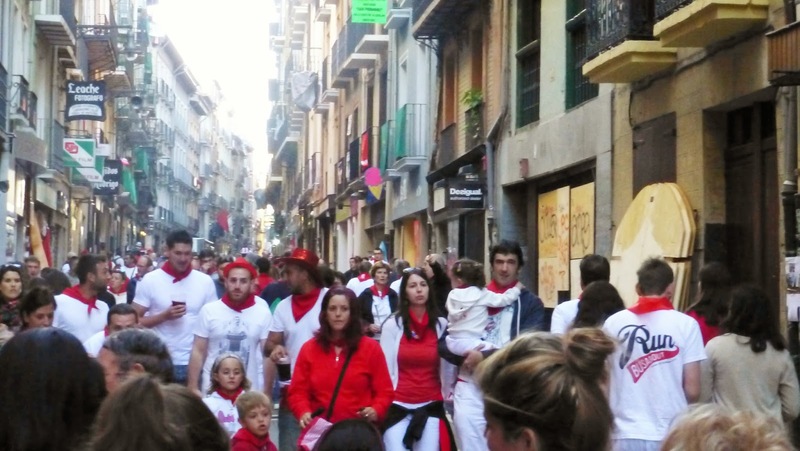 A few minutes before eight the festivities get underway with the singing of a chant to San Fermin to ask for his blessings. I’m of the opinion a prayer for a suit of armor might be more effective. While we’re waiting for the run to begin, the rules of the race are projected repeatedly on a huge screen overlooking the plaza. The video is accompanied with a familiar piece of obnoxious music that repeats over and over. I recognize the music - it’s almost identical to the music that accompanies the animated countdown urging people to head for the refreshment center at drive-in theatres. I see Brad trying to surreptitiously hide the lens of his Go-pro under his bandana. At 8:00am precisely the church bell tolls and two rockets are fired into the air signaling the bulls have been released. The runners begin running madly towards the bull ring 800 meters away. Our balcony is on a corner so I’m unable to see the bulls coming. A collective shout from the runners signals their approach. Many of them press themselves against the buildings or barricade fences as the bulls suddenly charge into view - fishtailing around the corner like formula one race cars on a wet track. The lead bull crashes into the barricade, picking up a runner who isn't fast enough to get out of the way, and tosses him head-over-heels into the street then proceeds to run down another half dozen runners who go down like bowling pins. The bulls disappear as quickly as they appeared leaving a dozen bodies curled up on the street. As soon as they're gone first-aide attendants bolt over the barricade to attend the wounded. A few moments later another rocket is fired signifying all the bulls have arrived safely in the bull ring and the run is over. The same can’t be said for the bodies in the street. I decide I made the right decision not to run today. Here is the first day's entire run. We head over to the bull ring to meet up with our runners. We find all but one of them flushed with excitement of having survived the event. Several are limping and others sport bruises over various parts of their bodies – not from the bulls - but from being knocked around by other runners. It’s only then we realize that Brad is missing. We don’t hear from him for several hours and are getting concerned when he suddenly shows up. He tells us just after the run began he was tackled by two large cops, dragged over the barricade, placed in a police car and his Go-cam confiscated. As he handed it over to the police he uses the camera’s WiFi to transfer the footage to his cell phone. The police tell him the fine for carrying a camera during the run is eight hundred dollars and demand to see his passport. When Brad tells them he doesn’t have it with him they tell him to get it and return. Brad is about to head back with his passport when I suggest they really don’t expect him to come back – they already have his camera. If they did, they would have personally escorted him back to his hotel to get his passport. The loss of the camera is enough – unless he’s foolish enough to go back and give them eight hundred dollars. Brad doesn’t seem to mind the loss of the camera since he has the footage and a terrific story. Jim, our Toronto member, is unscathed. Evidently the bulls were going to run him down when he informed him them he was from Toronto. They avoided him – as did everyone else. 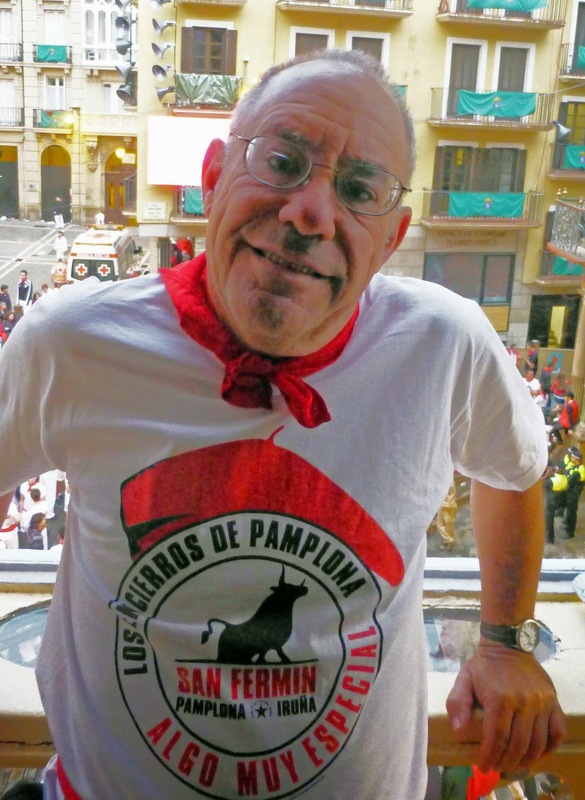 Because of the wet weather today’s run was considered one of the most dangerous in recent memory: two people were gored – one of them the American writer Bill Hillmann who co-authored the book Fiesta: How to survive the Bulls of Pamplona. I guess he should have read his own book. With the exception of the first runner who was gored in the thigh, the rest suffered only scrapes and bruises. I decide not to run the next day but to watch the race from a different vantage point. Carlos gets a spot where the street narrows to almost a chute - just before the bulls enter the arena. The bulls and runners go by in a flash - It's only when I slow down the footage can you see the pushing, shoving, people falling, and police rapping peoples' hands who are trying to climb the fence to get out of the way. Remember all this took place in about 2 seconds. Definitely worth watching. One lesson I learned from this trip: If running with the Bulls is on your bucket list, do it when you’re under 30. Hemingway was only 24 when he ran.